Our financial analysts are standing by to help you. Use our Analyst Enquiry service to connect directly with our team and ask questions relating to the company universe we cover and our sector-focused, maritime macro research. One of our Maritime Financial Research Analysts will help you put our research into practice and take the next step. We can assist via scheduled phone call or email exchange. Container Shipping - AP Moller Maersk, Evergreen, Hapag Lloyd, Hyundai Merchant Marine, Yang Ming, Wan Hai. Dry Bulk Shipping - DS Norden, Diana Shipping, Golden Ocean, Navios Maritime, Pacific Basin, Scorpio Bulkers and Star Bulk. Gas Shipping - BW LPG, Exmar, GasLog, Golar LNG, Navigator, Stealth Gas and Teekay LNG. Ports and Terminals - China Merchants, Cosco Pacific, DP World, Dalian Port, Global Ports, HPH Trust, Hamburger Hafen, Tianjin Port Dev, Westports, ICTSI and Santos Brasil. Tanker Shipping - DHT, Euronav, Nordic American Tankers, Frontline, Teekay Tankers, Tsakos Energy Navigation and Ardmore Shipping. Ports and Terminals - DP World and ICTSI. Please don’t hesitate to get in touch for more information regarding this service. Secondary offerings steal limelight in 2018, but will IPOs make a comeback in 2019? Despite low levels of interest in shipping IPOs in the US over the last few years, listed shipping companies continue to raise money through secondary/additional offerings and bond offerings in the US market. 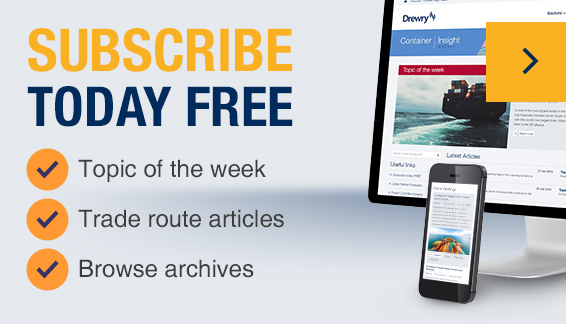 Drewry launches special report: Hyundai Merchant Marine (HMM) - what lies ahead? Drewry Financial Research has conducted an in-depth assessment of the issues facing HMM and their future prospects with consideration given to current and anticipated future market conditions. $6bn: The combined value of container shipping industry investments we have advised on since 2010. $20bn: The value of financing projects we have provided commercial due diligence advice for in port M&A since 2010. The number of countries in which our advisors have completed assignments since 2005. Our advisors have been involved in over 400 port assignments over the past 10 years. Our equity research service provides our clients with a range of report formats and supporting resources for the companies we cover. Investment analysis based on a clear understanding of the market at both an industry and sector level. Our analysts have access to one of the most up-to-date, comprehensive and reliable sources of market insight. LPG Shipping 2019 - Indeed a happy new year for LPG shipowners? Santos Brasil - Will Santos turnaround and deliver? The following disclaimer governs your access to this area of our website. By proceeding you accept this disclaimer in full. If you disagree with any part of this disclaimer click ‘cancel’ to return to the main Drewry website. Drewry Financial Research Services Ltd is incorporated in the UK and is authorised to provide investment advice in accordance with and pursuant to the UK Financial Services and Markets Act of 2000 (the “FSMA”). Drewry Financial Research Services Ltd is a wholly owned subsidiary of Drewry Shipping Consultants Holdings Limited, which as a group is focused on maritime research and advisory services. This investment advice given by Drewry Financial Research Services Ltd (DFRS or the “Company”) is solely for paid subscribers (the “clients”) who are qualified parties as per FSMA guidelines. Whilst the Company believes the information it uses for research is from sources believed to be reliable, the Company does not make any representation or warranty, express or implied, as to its accuracy, completeness, timeliness or correctness for any particular purpose. The opinions and estimates included herein reflect the analysts’ views based on available information on the dates specified and these views may have changed without notice. Any recommendation contained herein does not have regard to the specific investment objectives, financial situation and the particular needs of any specific client. The information herein is published for clients only and is not to be taken in substitution for the exercise of judgement by the client, who should obtain separate legal or financial advice. The Company, or any of its related companies or any individuals connected with the Company, accepts no liability for any direct, special, indirect, consequential, incidental damages, or any other loss or damages of any kind arising from any use of the information herein (including any error, omission or misstatement herein, negligent or otherwise) or further communication thereof, even if the Company or any other person has been advised of the possibility thereof. The information herein is not to be construed as an offer or a solicitation of an offer to buy or sell any securities, futures, options or other financial instruments or to provide any investment advice or services. The Company and its associates, their directors, officers and employees may have positions or other interests in, and may effect transactions in, securities mentioned herein. DFRS does not seek to do business with any of the companies mentioned other than sell them these reports. However, other related parts of Drewry Shipping Consultants Holdings Limited may seek to provide "advisory services or the sale of other group research products" to companies mentioned in this report. The subscription and distribution of this report is governed by the UK Financial Services and Markets Act of 2000 (the “FSMA”) and is restricted to qualified parties as defined by the FSMA. The subscription and distribution may be restricted by rules and regulations in certain jurisdictions. Persons into whose possession the report may come are required to inform themselves about and to comply with all applicable laws and regulations in force in any jurisdiction in or from which it invests or receives or possesses this report and must obtain any consent, approval or permission required under the laws and regulations in force in such jurisdiction. Drewry Financial Research Services (DRFS or the “Company”) is an independent research company and is not a registered investment adviser and is not acting as a broker dealer under any US federal or state securities laws. The Company does not provide individual investment advice or hold client money. As such, the Company is not required to be registered as an investment adviser.